What is the colour palette of your bathroom? Many bathrooms are neutral and light in colour, some have a primary and secondary colour palette. Look at the colour palette that you‘ve decided for your bathroom and ask yourself whether the hand dryer(s) should blend in to the background or pop out from the wall. The best colours to blend into a neutral bathroom colour palette is going to be either white or silver. The JetDryer Executive2, Business and Eco are all available in white. The example below is taken from a bathroom installation at the Ararat RSL just outside of Melbourne (see customer story here). How much wall space do you have in your bathroom? Where bathroom space is limited, sometimes you won‘t have enough physical room for towel dispensers or large hand dryers. Even if you could technically fit enough hand driers in, it may look a little unusual. Selecting a smaller hand dryer whose dimensions are in keeping with your overall bathroom, can be the ideal workaround. If you are installing two or more dryers, each hand dryer should be no closer than 610mm from the centre. 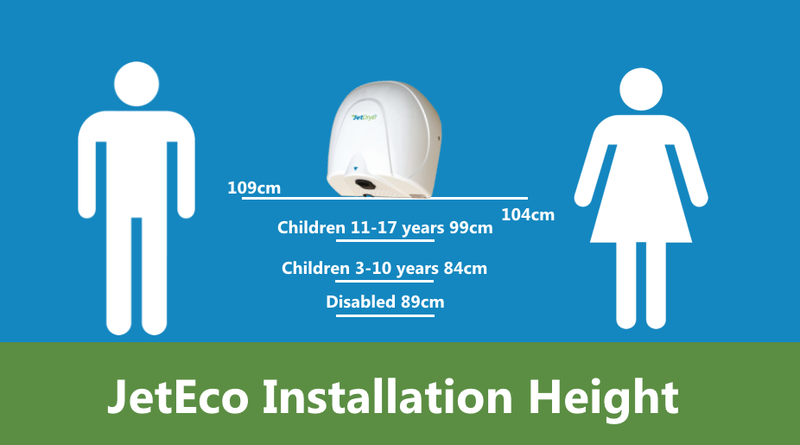 The JetDryer Eco has a small footprint on your bathroom wall, weighing 4.5kg. Is bathroom ambience a consideration? Bathroom ambience comes from all the individual sensory elements that us humans navigate the world with. Bathrooms aren‘t always the nicest sensory destinations for olfactory nerve, also commonly known as our nose! Selecting a hand dryer with a fragrance option is one way of neutralising these odours. The JetDryer Executive2 includes fragrance as standard and with the JetDryer Business it‘s available as an option. Does your bathroom design need to be tough? Bathrooms designed to be tough have stronger components that can withstand potential damage. You can get stainless stell soap dispenser with multiple bolt mounting systems, you can also get vandal proof toilets made specifically for the toughest environments. Tough bathrooms are usually designed for environments such as Police stations, prisons, detention centres, hospitals, school toilets, train stations and public toilets. Our contribution to creating a vandalism resistant environment, is the JetDryer Eco which is constructed from strong die cast aluminium. You can select from any of the JetDryer Eco range to enjoy these strength properties. They‘re also guaranteed for up to 350,000 uses within the warranty period of 3 years parts and 1 year labour. How high should I install my hand dryer? This depends on who the bathroom is primarily for and whether you have decided on a hands in or hands under dryer (add link). Men tend to be taller than women, pre-schools need a different height from colleges and disabled toilets have a specification to meet.